Have just finished another fascinating read, the 2nd instalment of T.Olivers’ trilogy “The Blue-Eyed Boy” .The protagonist Barney Roper has made the decision to travel to Asia on a quest for answers to the enlightened way, as practised by the Buddha; as well as to achieve a romantic conquest. What he finds is unsettling on both counts. Barney & Alice are now separated & each has been facing the challenges of getting on with new partners; plus the demands of their children whose own adolescent lives have been a cause for concern & feelings of guilt about “not being there” enough for them. Frustration is the result of these challenges. Trying to juggle the relationships of ex wife & children with his own need to be “getting on” with his 3rd age & the freedom this stage of life is supposed to afford. Will he finally find some sort of peace of mind? I look forward to the conclusion in “The Single Step” the final book of his trilogy. Riveting, amusing & thought provoking stuff ! 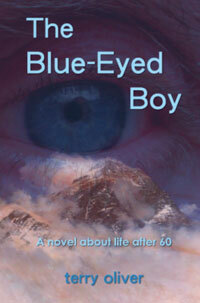 I found Terry Oliver’s latest novel, “A Blue Eyed Boy” a compelling and fun romp. 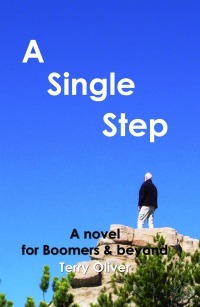 As a retired guy at the head of the Boomer pack, it is a treat to follow his main character Barney, as he fumbles his way toward what he hopes will be ecstasy through the third (and penultimate) stage of his life. What he encounters is a potpourri of high adventure, disappointment, love and humor. A very good read. I have read the first two books in Terry Oliver’s 3rd Age trilogy. After reading The Blue-Eyed Boy, I anxiously await the release of A Single Step, the final book in the trilogy. I thoroughly enjoyed In Hot Pursuit, but The Blue-Eyed Boy brought me to a new level of familiarity with the two main characters, Barney and Alice Roper. Both characters live life apart after a marriage separation, but in many ways they still stay connected through their children and life experiences. Barney Roper’s travels in the far-east were an excellent back drop for this story. Mr. Oliver’s writing style is so captivating that I often lost track of time while reading the story. I am a few years shy of becoming a 3rd ager. However, sharing the adventures of Alice and Barney through reading this book makes me take a more optimistic look toward aging. I look forward to many great personal adventures to come. You can’t help but admire the unrelenting nature of Barney Roper and his desire to experience all that life has to offer. “If you are over 60 and enjoy a good story – read this book as Barney Roper travels to the East seeking wisdom, insight and meaning to the third age of life. 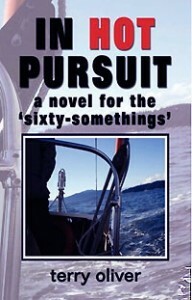 After a wait of a nearly two years, I became reacquainted with Barney Roper and the other characters that Terry Oliver brought to life in his first book “In Hot Pursuit”. In the first instalment of his trilogy, the author led us through the early events of his main character’s quest for a meaningful third stage of his life. Set in London, Oxford and Vancouver, we learned of the amicable breakup of Barney’s marriage and his determination to maintain close relationships with his children. In his new novel “The Blue-Eyed Boy” Barney continues his search. We travel with him from Vancouver to the Far East where Barney endeavours to find enlightenment in the teachings of the Buddha. He finds that the “New China” has a number of surprises that he did not expect. His estranged wife’s story continues to fascinate the reader as well as she pursues her archaeological studies -and a new relationship- at Oxford. Oliver’s easy style takes us with his very likeable characters and moves the narrative easily along. I especially enjoyed the passages that took us through China and Tibet as the author writes from his own experience of travelling off the beaten path, using local transportation and staying in local inns. Excellent reading! I couldn’t put “The Blue-Eyed Boy” down until the last page was turned. .